August 28th will be known now as "Angela Yee Day"
98.5 The Beat is proud to announce that Angela Yee of The Breakfast Club just got her very own day. Excitement hit New York City as Mayor Bill de Blasio and the firsrt lady of NYC Chirlane McCray had delivered a proclaimation to Yee. 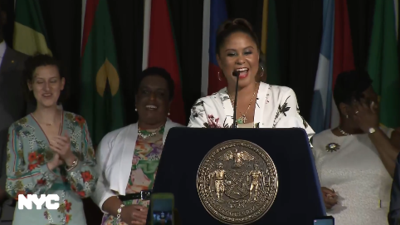 In the video below, the mayor of NYC was there to deliver remarks at the West Indian American & Caribbean American Heritage Reception. You can watch the speech at the 16:00 mark of the video. Mayor de Blasio, reads the last line of the proclamation and then hands the mic over to Angela where she thanked all who was in attendance. In addition to the proclaimation, Yee was also appointed a New York Public Library Ambassador. This title means that Yee will be hosting different book clubs at different libraries across New York City. The president of New York Public Library, (NYPL) Tony Marx shared a statement about his excitement in her new role.